Or Derv Foods Inc. is a manufacturer of deep-fried specialty appetizers, which are sold into both the retail and foodservice segments of the market. The Company’s main products include: Banana Peppers, Bunny B Sauerkraut Balls, Falafel, Lobster Bites, Pickle Planks, and Wonton Poppers to name a few. 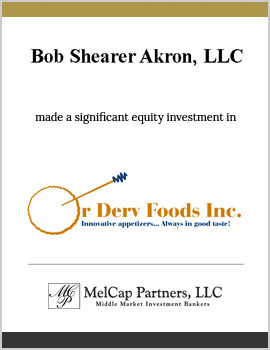 MelCap Partners acted as the acquisition advisor to Bob Shearer Akron, LLC. Principals of MelCap Partners, acting in the capacity of registered agents of M&A Securities Group, Inc., successfully represented Bob Shearer Akron, LLC in the acquisition of Or Derv Foods.